Participants: George Hill, Luc Harvey, Alastair White, Tom Curran, Cassandra Elphinstone, Haley Foladare, Will Kirby, Alex Wharton, Shu Yu Fan, Robert Shilton, Aye Min, Lukas Schreiber, Daniel Tan, Eric Pollard. Part 3! Will this project every end? That’s the hope with this trip. The last part of the climb to the top is always the most daunting and exhausting. This trip certainly lived up to that. 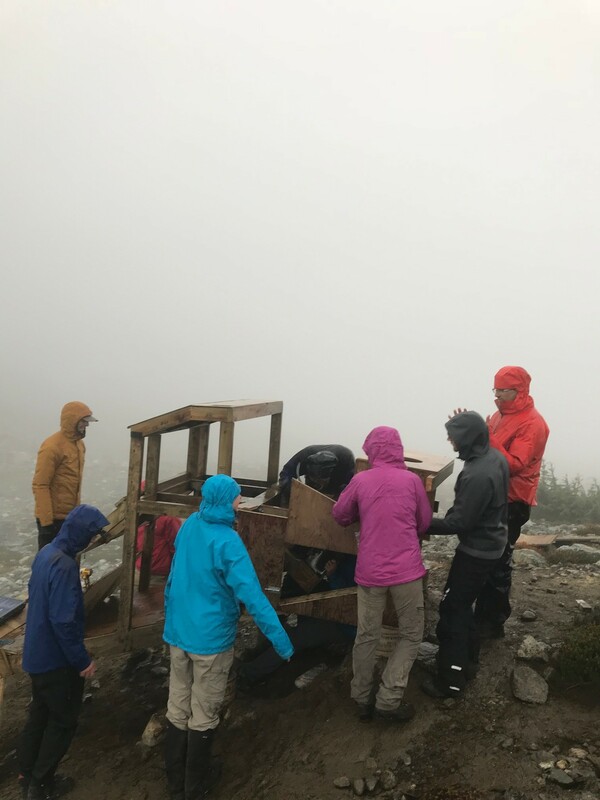 The Part 3 team mid flip of the old outhouse structure. Cassandra slowly making her way on to the roof to fix the chimney cap. Alastair and Haley drilling holes in the frame so that the weather-stripping could be attached. Luc and George working on the outhouse base. Will, Luc and Shu Yu attaching the columns to the foundations. On this trip, Alastair, Tom and Alex were our trusty drivers. 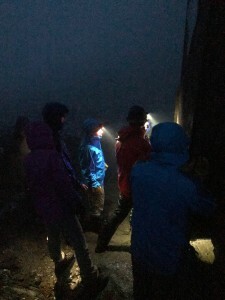 Tom, Cassanadra, Shu Yu, Will and Haley went up to camp at the trailhead Friday night. The rest of us had a blistering 4am wake up to avoid the Whistler Grand Fondo bike race. Highway 1 in West Van was shutting down completely at 5:30am. If we were to make up to the hut at any reasonable hour, we couldn’t be late getting to Horseshoe Bay. Thankfully, our two morning cars met at the old Tim Horton’s in Squamish at 6:00am. The new Tim Horton’s would have been nicer but google maps told me it didn’t open until 7:00am. Supposedly this is wrong though and it’s open 24 hours. I still don’t really know. At the Timmies we went through the plan for the weekend. You could essentially call it a pre-trip. We were going to pick up Luc at his place in Squamish like last week but, his dad decided he wanted to join us for the Saturday and so Luc would meet us up there a bit later. We arrived at the trailhead about 8:00am, Tom’s party was eating breakfast and so we casually unloaded and faffed for bit splitting up all the tools between all 13 of us. Eventually we started up the trail with Tom taking up the rear. Rob, Alastair and I made quick work up the hut while Cassandra, Tom and a few others went for a morning swim in Brew Lake. We were never expecting good weather on the trip since it was forecast to rain start to finish, however, up to this point the weather had been good to us. I’d be hard pressed to call the weather good, but it was dry at least for the morning. This would soon change. 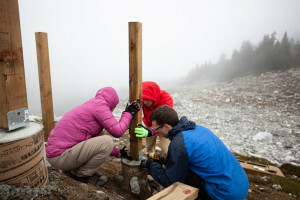 Up at the hut, we began the construction process. Cassandra went up on the roof this time with a proper rope and harness to install the new chimney cap while Alastair and Haley worked on the door and I began work on the outhouse construction. One of the challenges of beginning construction on the outhouse was to cut the columns to the right size so that the structure would sit level. When initially designing the structure, our shortest column was going to be at far end of the structure, but now our shortest end needed to be at the close end since our new outhouse location was on a steeper slope than before. The bedrock being nearest to the upper part of the slope also exaggerated this steepness. The short stubby far end columns were removed and discarded while the near end columns were switched to the far end. We installed the near end first and then held up the back end with spare lumber and then measured directly the distance we needed to cut the new members. Unfortunately, by the time we got all the columns cut to the right size and the base of the structure together, the rain and wind began. 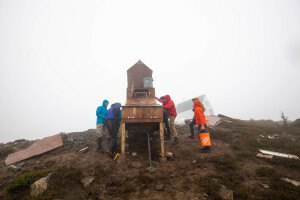 At the old outhouse, Tom and Lukas were working on how to get the old outhouse structure off its base. The old outhouse was made of 2.5” by 3” columns that extended below the floor by 5” in each corner. The plywood walls against these columns only extended to the floor and they rested upon square 5” beams. Outside the outhouse on top of the 5” beams were some 2×6 beams that had been fixed to the 5” beams and the plywood to form a moment connection (prevents the thing from tipping over from out of control split-boarders). 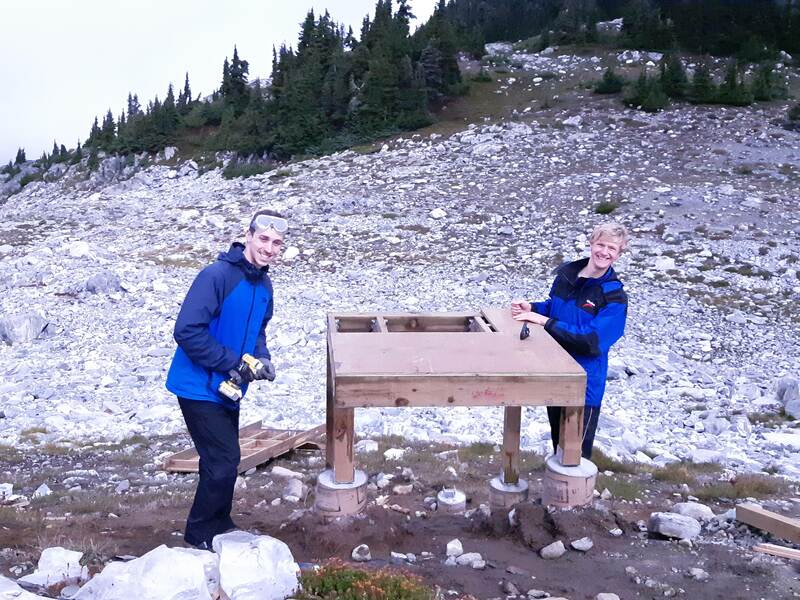 The plan for the new outhouse was to re-use the upper structure of the old outhouse and so Lukas and Tom worked to remove and separate the upper structure from the 5” beams and 2×6 members. In the meantime, Aye Min and Alex worked on fixing a metal sheet over a 4’x2’ plasticy fency thingy. This thingy would eventually become the solids stopper. Alastair, Eric, and Shu Yu under the leadership of Luc’s dad built a small trench below the outhouse for the liquid waste disposal. The trench ended up being about 12” deep and was then filled 2” with small rocks, 2” with the perforated ABS pipe and then covered in dirt. The idea was that the small rocks would prevent soil intrusion into the pipe while allowing most of the urine to drain away into the soil rather than form a puddle at the outlet. The outlet is 8 feet downslope from the structure and was covered up by some boulders to keep the pipe end free. Luc, Daniel, Alex and I continued to work on putting the new superstructure together. Working on the back hatch with headlamps on in the wind and rain. The old outhouse structure almost ready to be lifted on to the new base. Rob and George both under the pedestal trying to make the liquid waste collector fit onto the structure. Cassandra in the light blue accurately depicts how cold and wet everyone it through her stance. Cassandra and Robert worked on waterproofing the liquid waste collector with tar paper and metal flashing. Once that piece was finished we brought it over to the structure to be installed. One problem however was that some of the metal flashing was getting in the way of the piece going in and so we spent an excessive amount of time trying to troubleshoot why it wouldn’t fit. Rob had a rock to sit on under the structure that made his 20min under there somewhat more enjoyable. At least he was dry. At this point all of us were drenched and the wind was piercing and cold. Once the liquid waste collector was in we could finally move the old outhouse on to its new home. Despite its small stature, the old outhouse was still quite heavy. 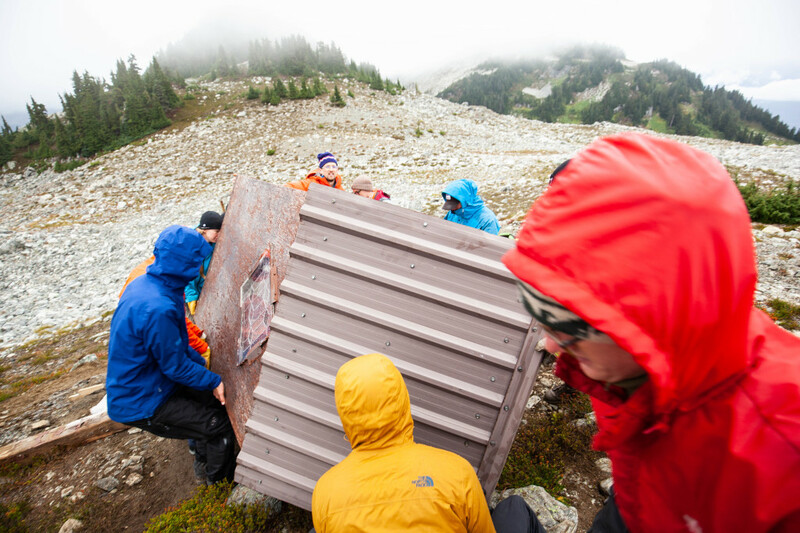 Initially we tried with 6 persons to lift it, but quickly realized we’d need at least 8 or more. We gathered everyone up and hauled the thing over to the space in front of its new home and then spun it 180 degrees along it’s Z-axis (think flipping a table when you stand up out of anger at the wind). The columns that stuck out below the plywood walls were cut off next and then everyone gathered back around the structure and lifted it up on to its new pedestal. To secure the old structure to the new structure, new 2x4s were placed along the bottom edges of the old plywood walls on the inside of the structure. 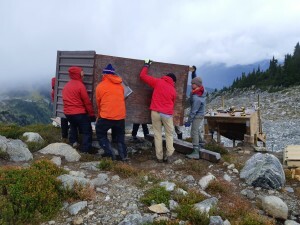 On the outside of the structure, plywood pieces were to act as shearwalls transferring lateral loads (like hella high winds with rain) from the old structure to the new base. Screws were drilled through these shearwalls, through the old plywood wall and into the new 2x4s effectively sandwiching the old outhouse into place (like the sandwich of me, water and my jacket). Eventually the frame came together, and then the doors and hatches. The structure had reach it’s first stage of completion. By this time it was 9:00pm and I had not eaten dinner, nor seen the inside of the hut since 2pm and had refused to stop working because I knew going back into the hut getting warm and coming back out would just make me feel colder and interrupt getting things done. I was very cold. My jacket was only waterproof for so long before eventually just soaking through. I didn’t want to get my puffy wet so I hadn’t worn it all day even though I could have used it. Tom certainly looked more comfortable than me. Oh, I wish I had a jacket that worked as well as his did – or maybe he is just exceptional at hiding his suffering. Thankfully not everyone was as eager to stay out till the bitter end like I was and when I finally came back into the hut, Haley, Will and Eric had found the food for our group dinner and had prepared everything. With my puffy on, hut booties on and food, suddenly I had colour in my face again. Also, some beers I brought up last weekend but didn’t finish were still untouched and opened! 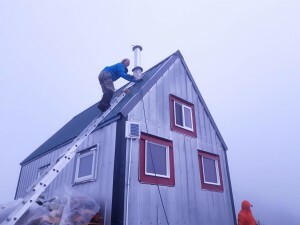 Some other thankfully had the foresight to start up the wood stove in the hut and I could not have been happier to have a stove then at that moment. A view of the outhouse mid construction with the mechanical unit temporarily inside the structure. The top of the conveyor belt where the solid waste drops into the storage unit is visible. The outhouse structure at the start of day 2 with the old outhouse on the structure, the doors and hatches hung, and the liquid piping system complete. Installing the waterproofing within the upper part of the solid storage unit through the side of the structure. The next day the list of tasks to complete were still quite extensive: the solid waste storage unit had to be waterproofed, the metal roofing of the storage unit had to go on, steps to the new outhouse had to be made, the door at the hut had to be painted, caulked and weather-stripped, the firewood had to be filled for the winter, and the rest of the firewood had to be moved against the hut and packed more tightly so it would all fit under the tarps we had so it could dry out. Cassandra, Robert, Shu Yu and Tom worked on the solid storage unit; Daniel, Eric, Will and I worked on the roof. Alastair and Haley worked on the door; Alex, Lukas and Tom built the stairs, and; Lukas and Aye Min worked on moving the firewood. The weather wasn’t any better than last night and it continued to rain sideways. Today I had the better judgement to wear my puffy under my jacket so I could stay warm and get more work done. The waterproofing work today was more difficult though with the wind. Between the wood and the metal flashing or roofing, we were going to use tar paper. Ideally it would have been dry and clean under the tar paper with the tar paper neatly wrapping the wood. This was a somewhat laughable goal though. We couldn’t keep ourselves dry and free from dirt let alone the structure. Also, with the powerful sideways gusts, measuring out the tar paper in place, or even laying it out after it had been cut was like trying to eat soup while being driven 75km/hr down the Chance Creek FSR. By 4:30pm the door was all finished, the firewood stacked, the outhouse steps complete, the roofing complete and the upper part of the solid storage unit waterproofed. What was left was re-hanging the old outhouse door so it wouldn’t be ripped off by the wind, securing the rain barrel, finishing the solid storage unit waterproofing and other small tasks. At this point Alastair’s and Alex’s car decided to head out; there was only so much space around and in the outhouse to get the last parts done and so staying wouldn’t have really helped much anyways. Tom, Cassandra, Shu Yu and I decided to stay until it was done and hopefully head out before it was too late. Cassandra and Shu Yu continued working on the inside with Tom and I doing the various other tasks that needed to be done. One neat addition was a small 2-inch diameter cylinder that had a 1” square solar panel on one side and a single LED on the other side. $2 from Rona! As the light dimmed, thankfully so did the rain and wind. Eventually the skies even cleared, and the stars came out. It was well appreciated since we had all been working non-stop through the rain for the past day and a half. Tom and I finished up the bottom end of the storage unit in the dark and Shu Yu kept the stove going in the Hut. She was the love and saviour of my puffy which direly needed to be dried out. She had lent me her jacket for the last hour of work or so. Thank you Shu Yu! The very last step was to slide in the mechanical unit, pop on the bike pedal and voila! The “Sh!t-o-matic” was finished! 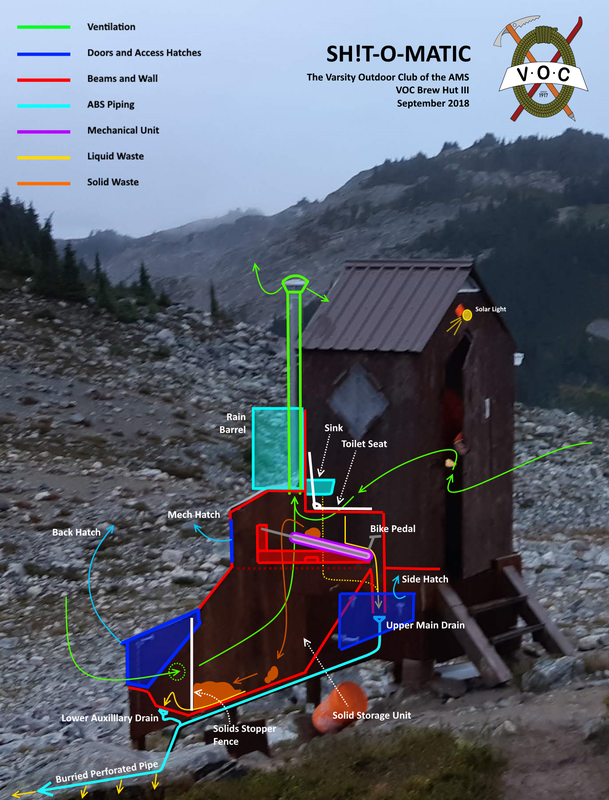 An x-ray view of the outhouse showing how the thing works. The outhouse fully complete and in operation! When you are at the hut next you will be able to use it too! 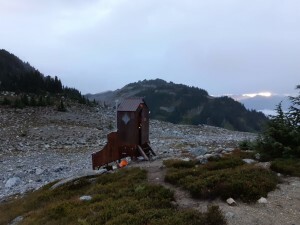 To use it, all you have to do is go about your business as you would any other outhouse, except afterwards if you pooed, we ask you to push the bike pedal three or four times. If you go pee, you don’t have to do anything. The system works through the use of a simple conveyor belt attached to a wood frame at an angle. When you go pee, the urine drains down the conveyor and is piped away into the ground. When you go poo and push the pedal three to four times, it moves up the belt, dries out and then eventually drops into the back of the outhouse when the next user comes along. The poop further dries out in the storage unit and will eventually compact under the self weight and the angled slope of the solid storage unit. 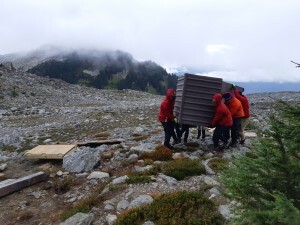 When the storage unit is full, we lift up the back, slowly lift up the solid stopper fence that prevents all the waste from coming out when you open the back, and then shovel the remains into buckets which we can then disperse away from the hut near a patch of trees where it will easily decompose. The reason we separate the solids from the liquids is because the liquids inflate the volume of the solids which then freeze over winter and take up extra capacity. The urine also causes the solids to smell much worse than they would otherwise, and they prevent any natural decomposition that might occur. 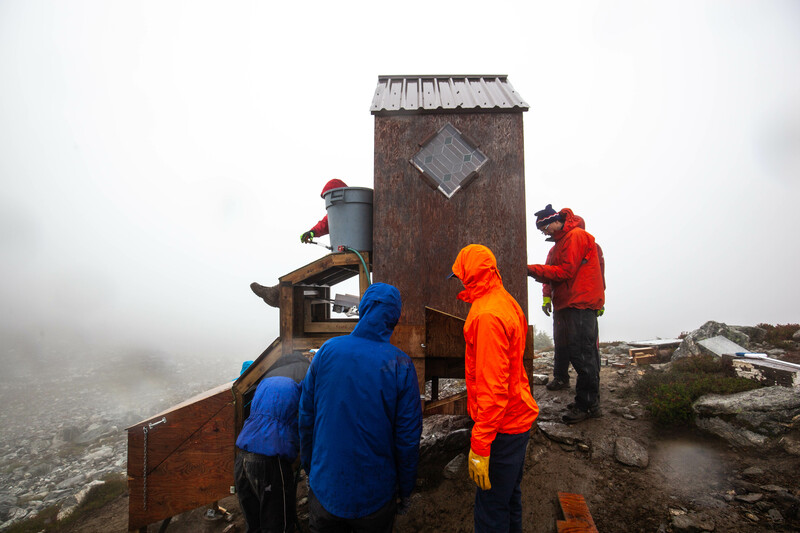 As a result, we will have less solid waste, a cleaner and less stinky outhouse, and an outhouse that can be maintained much easier than any of our other huts. Warming up inside the hut, I was thankful to have brought extra noodle soup. It was now 9:45pm. Tom had said earlier “I don’t want to stay too late”. Unfortunately, 9:45pm was pretty late. Plus, all of us needed time to warm up, dry off and clean up everything. It would be an hour minimum until we were even remotely reading to leave and so we contemplated staying an extra night and leaving early in the morning. We all made some calls then eventually made the call to stay. Warming up and having a good sleep in the Hut was somewhat desired by all of us at the point. We all had our extra food as well, so we were well prepared to make it work. We awoke at 5:00am the next morning and intended to be out by 6:00am. 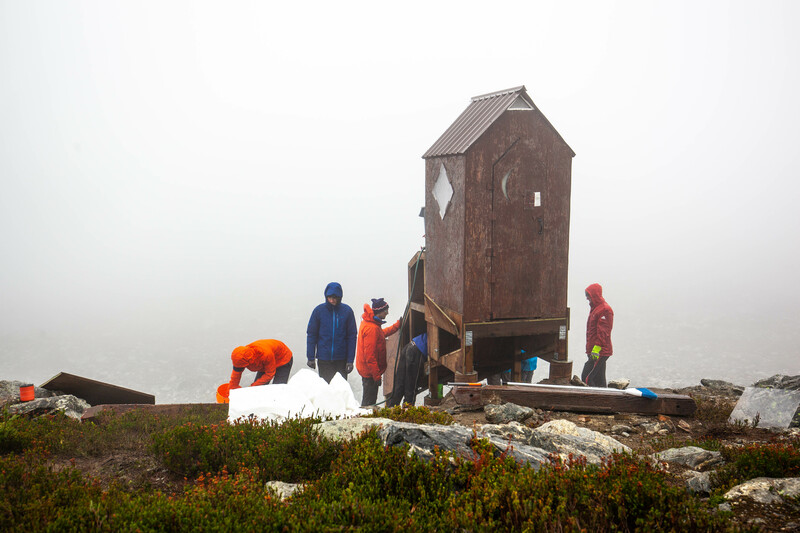 We probably could have been ready to leave at 6:00am but we decided to take some more time to clean up around the hut. The outhouse had its inaugural use by Shu Yu for a number one and Tom for a number two! The morning weather was dry, and the hike out was pleasant. I almost considered myself lucky because I was sure the other cars were more like cold and stale half filled hot-tubs. This project was a big undertaking and I really want to thank everyone who came out to each workhike, who showed up at my house to help with construction, who gave us advice when we needed it and who supported us throughout the process. There are a few people in particular who really stepped up and deserve extra recognition. The Solid-Liquid separator is the brain child of Edward Lim, a VOCer in his fourth year of mechanical engineering. He spent 200 hours over the course of the spring and summer designing entire thing from scratch, sourcing every part, water jet cutting anything he couldn’t buy, and then assembling everything. Luc Harvey and I worked on the structural aspect of the project and I want to thank him first and foremost for keeping me sane, and second for stepping up to help with construction even though he initially only committed to helping with the design process. In particular, Luc lead the design and construction effort to create a solid foundation for the new structure. Without Luc’s help, we wouldn’t have nearly as nice a product or a product that will last nearly as long. Richard Hill, who let me borrow his tools for the pre-construction. Without his help I wouldn’t have been able to even start such a project. Thank you. Jeff Mottershead and Christian Veenstra for providing advice along the way from what kind of epoxy between rebar and rock to helping me organize the helicopter successfully. For Will Kirby, showing up at my house to help with the construction was his first time ever participating in a VOC shenanigan. He biked all the way to my house from UBC, only to find out he didn’t actually arrive at my house – he arrived at the West Vancouver address for my house rather than the North Vancouver address. It was sunny though, and he shrugged it off as a nice workout. Will Kirby was one of the first people to commit to coming on both workhike trips and has helped out with various miscellaneous things throughout the project. He is also responsible for the beautiful plaques being made commemorating the project. Derek Hiemstra, Alex Wharton and Lukas Schreiber were helpers during the pre-construction and came by my house a few times to assist in the woodworking and assembly. When I had helpers, I could get things done twice as fast. Thank you. Haley Foladare, our Hut’s Coordinator, helped me write the original grant which gave us the funding to complete this ambitious project. Throughout the project she supported Luc, Edward and I while being in a different country and when she got back, immediately came to help on the construction workhikes. Haley and Will, on the eve of the first workhike graciously agreed to stay at my house on the Friday night to help me load the truck. Thank you both for giving up your Friday night and staying up till 1:30am to help the truck get properly loaded. First and foremost, has been MEC. 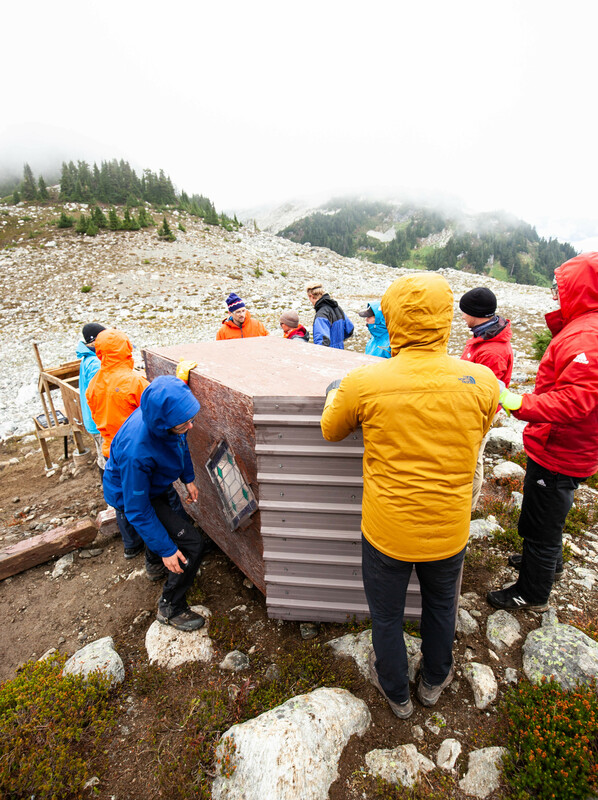 This project was made possible in part through the MEC’s access and activity grant. The MEC for this project helped fund $7,100 of the final $8,600 project cost. Through the MEC’s support for the VOC and our backcountry huts we have been able to complete many more projects than we would be able to do otherwise year after year. Our huts have stayed in great condition because of this support allowing us to further the VOC’s mission of encouraging self-propelled and environmentally conscientious wilderness adventure, education and sustainability. MEC, Thank you. Blackcomb Helicopters has helped the VOC in many projects for all of our huts and continues to provide exceptional service. Both Ben from Squamish and Andy from Pemberton have given their time to help us coordinate our projects and to help us learn how to efficiently plan to use a helicopter such that we can get the most out of every helicopter dollar we spend. Blackcomb Helicopters, Thank you. Driving Force has supported the VOC in the number our hut projects over the years by providing us with superb rates and even sometimes extra mileage. On this trip in particular the cost we saved because of the support of Driving Force was likely more than $400. Driving Force, Thank you. Dynamic Equipment Rentals in North Vancouver rented us the Hilti hammer drill that we used for creating our foundations. Sean, the owner there was incredibly helpful in getting us a tool that would work for us in such a unique scenario where any equipment we brought in would have to be hiked out 4km afterwards. Going with DER saved us more than $150. Sean and the DER Team, Thank you. Paul with Richmond Building Supplies assisted us with sizing and ordering a proper polystyrene insulated commercial steel door and also ordering all of the appropriate accessories to accompany it. Paul has been exceptionally accommodating to the VOC and has been able to deliver us quality products that have efficiently met the VOC’s needs. To Paul and the RBS Team, Thank you. This entry was posted in Huts, Special Reports, Trip Reports, Workhike and tagged Brew Hut, huts, outhouse, Workhike. Bookmark the permalink. George and team…Wow! What an effort! Heroes! You folks all put in a huge amount of work in this design, construction, logistics. Pillars of volunteerism! May you and many others enjoy the Brew outhouse (and surrounding area) for many, many years, and may these events seal the fate of the Poopiscle of Brew forever! 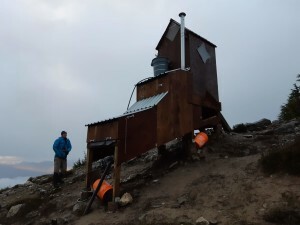 The VOC has tried to figure out how to come up with a real solution to the Brew Outhouse issue since before I turned up over a decade ago – it’s amazing to see that you managed to come up with an innovative, grassroots solution and then actually executed on it. This is an incredible effort – amazing job to everyone, I can’t wait to check it out the next time I’m in the area. Thanks for writing this George! You really put a lot of work into this project! 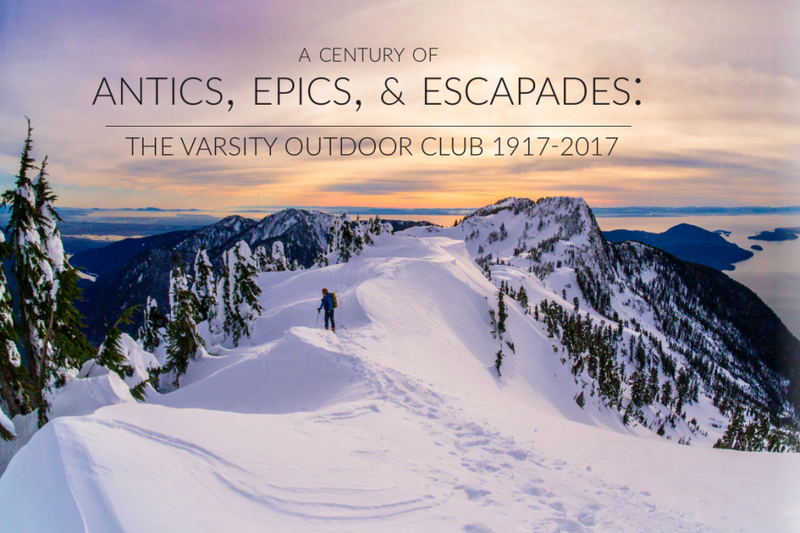 The Vancouver outdoor community is very thankful for all your very dedicated work! Amazing work everyone involved! Can only imagine the email faff behind this project. Thanks for all the hours you all put in. Can’t wait to try it out in one of those typical whiteout days at Brew. Holy macaroni, what a tremendous feat and coordination of time and volunteerism! Thank you George, Luc, Edward, and team!